farnovision: An "Insider's" View of "The Farnsworth Invention"
An "Insider's" View of "The Farnsworth Invention"
In an open discussion with audience following the Sunday, March 18 matinée performance of The Farnsworth Invention at the La Jolla Playhouse, playwright (and screenwriter and TV impresario) Aaron Sorkin quipped that with his years of experience in the business, he'd learned to give the audience what it wants: "...and it's clear to me that what the audience wants is a play about 1930s patent law..."
I can't speak for the rest of the audience, but anybody who knows me knows that that is precisely what I've been advocating for....oh, thirty-some years now. So I filed into the theater this past Saturday night with a perspective quite unique from that of anybody else who was in the hall, because I have been living with this material all that time, and know the "true story" probably better than I know my own life story. I must confess, I entered the theater at first fully expecting to hate everything that was about to unfold before me. I had sufficient "advance knowlege" of what I was about to see that I was certain there was no way I was gonna like it. And, indeed, after the first viewing, I was entirely conflicted about the disparity between the production's dramatic impact and its divergence from what I would consider historical propriety. Fortunately, I am not only writing this review from the unique perspective of my "insider's knowledge" of the facts; I also saw the play twice -- first on Saturday evening, and then again Sunday afternoon. What I realized on the second viewing was that I had watched the first performance with my nit-picker turned up 'to eleven.' I actually made all kinds of notes about little details that were "wrong." But when I watched it again Sunday, I left the nit-picker at the door, which freed me to sit back and enjoy the production as any newcomer to the material might. And from that perspective, I was much better able to appreciate the scope -- and, yes, the grandeur -- of what has been accomplished here. At the La Jolla Playhouse, you wait for the lights to dim rather than for the curtain to rise, because there is no curtain at the La Jolla Playhouse. You could in fact safely say that there is no actual "stage." The action all takes place on the theater floor; there is no proscenium separating the actors from the audience. So it is entirely appropriate when the first actor to take the stage is more or less 'in your face when' he says, "My name is David Sarnoff..." because that character is pretty much in your face for the next two hours. In order to convey what is admittedly complex and esoteric material, Sorkin has adopted a theatrical convention known as "the unreliable narrator." Only in this case, there are two narrators, working off each other as a pair of Greek choruses might, each adding color and detail to the other's story line. The "David Sarnoff" character narrates the "Philo Farnsworth" sections of the play; the "Philo T. Farnsworth" character narrates the David Sarnoff story line. The narrators are considered "unreliable" because you can't always believe every word they say. So, yes, this is two, two, two plays in one. In one story, we follow the path of the young scientific genius as he struggles to overcome his circumstances (i.e rural, working class roots) to achieve his quest to invent electronic television; in the other, we watch a young business mogul as he struggles to overcome his own circumstances (i.e. antisemitism) in order to pursue a Utopian vision of the future of broadcast communications. Those two story lines collide in the climactic second act. The production wraps Sorkin's densely worded but fast-paced dialog with powerfully simple direction and staging. Director Des McAnuff employs an absolute minimum of stage effects that forces the audience to focus on the actors and the story. The set relies on little more than a few tables and chairs for "set decoration," and their movement into different configurations becomes part of the action. Long ago, Aaron Sorkin said that he is aware that there is a "Sarnoff camp" and a "Farnsworth camp" in the telling of these stories, and insists that he is not in either camp. "I just hope all the jokes work," he said once. He can rest easy at least on that score. There are amusing moments through the entire production, that keep it light in the midst of all the heavy material. It is, in a word, pretty entertaining. Above all, he has chosen to avoid the familiar, perhaps now too-conventional "bio-pic" approach of, say, "Tucker" or the 1930s "Edison" movies. He has instead taken the "Salieri -v- Mozart" approach that worked so well in Amadeus (which was also a stage play before becoming an Oscar-winning film). And I would have to say that, by and large, the approach delivers a production that is worthy of the material and all those who have come together to make it live. While I'm fairly certain that I -- with my too-acute knowledge of the actual facts -- would have made different choices from those that Aaron Sorkin has made here, I think that he has made the right choice to begin with: to tell these stories, and to invest in them the kind of 'heart' that is a trademark of this writer's best work. To to weave these stories together as he has -- I thought, and much of the audience seemed to think also -- gives them both a measure of majesty they might not accrue alone. 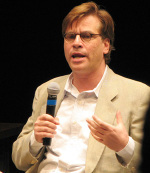 Sorkin is well aware of the liberties he is taking with the historical story line. "Playing fast and loose with the facts" he says. But it is also clear that he knows at least the basic contours of those facts, and -- I think -- he pays suitable reverence to the spirit that glues them all together. A good example of how the script compresses events, and the manner in which they are staged, is the "first picture" scene, about two-thirds into the first act. The scene begins with much of the 18 actor ensemble gathering in "the lab." A "camera" is rolled out that looks exactly like the big boxy camera seen in the 1928 photos from Green Street. A triangle is set in motion at the end of a pendulum, a curtain is pulled and everybody assembles around the receiver. It may seem odd to some that the "picture" itself is never seen by the audience; the screen of the receiver is turned in such a way that we see only the back of the wooden box -- and the faces of all the players. First there is consternation when they see nothing but "fuzz" on the screen. Then, gradually, they begin to realize that a curling pattern they see in the center of the fuzz that looks like smoke... IS smoke. Phil runs behind the curtain and realizes they are seeing smoke from a cigarette on the screen, and there is great jubilation among the ensemble. Some how it all works, and I sensed that I was not the only one in the audience having a "chicken skin" moment witnessing this portrayal of the first "all electronic television picture." What Aaron has done here is compress at least three actual events. Back in 1927, the first picture was a straight line; later, there were geometric shapes, like a triangle. A few weeks after that, accidentally, the curls of cigarette smoke were observed, one of the first instances in which actual motion was seen on the receiving end. The playwright has chosen to borrow the best elements of these three events, and between the words, the actors, and the staging, this provides one of the most rewarding moments in the whole production. This is an effective rendering of a moment that I keep saying was "a breakthrough of epic proportions." Unfortunately, some observers will dwell on the historical inaccuracy of the choices that the playwright has made -- like suggesting that the smoking cigarette had belonged to Pem, who was never a smoker, when in fact the actual cigarette in 1927 belonged to Cliff Gardner. That may not be a minor point, but there are plenty of other nits to pick: The potato-field moment of conception was 1921, not 1920; Everson and Gorrel put in $6,000, not $3,000; The Crocker group gave Phil $25,000 and a year to produce a picture, not $20,000 and six months; William Crocker is portrayed as the leader of the bankers' group, when it was really Jess McCargar and, even more so initially, Roy Bishop. But the essence of it all is there: a group from San Francisco financed this kid with the crazy idea about sending pictures through the air on a beam of electrons, gave him a limited time to produce results, and he does just that. Nit-picking aside, I came away from both perfomances with high regard for the two principal players. Veteran stage and screen actor Stephen Lang portrays Sarnoff, and actually manages to make him a likable character despite -- or, to some extent, actually, because of -- all the character's bombast and bluster. Sarnoff is portrayed as confident, belligerent, dynamic and elegantly tailored throughout the production. That I could find myself actually liking this "character" that I have drawn in my own work as "the Darth Vader of the communications industry" is at least a testament to the way Stephen Lang plays the part as it is to the way the playwright has written him. When Ann and I were walking across the parking lot to the theater Sunday afternoon, Stephen Lang drove in right behind us. Our paths never quite crossed, but if they had, I imagined myself saying something complimentary, along the lines of "you've done the trick of taking a character I have loathed for thirty years and actually making him likable despite his contemptible conduct." Anybody determined to despise the Sarnoff "character" in this production (as opposed to the real, historical figure) will be sorely disappointed. 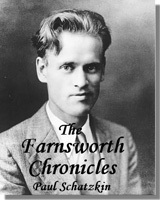 The Philo T. Farnsworth character comes off in stark contrast. He's slightly disheveled, the three piece suit that he wears throughout looking a bit frayed and dingy, his hair always slightly askew. I kept wanting to reach out on the stage, to straighten his suit, button all the buttons on the vest, comb his hair... until I realized that such details are what the context requires, in order to convey adequate contrast between the two protagonists. Also, I think that Jimmi Simpson's portrayal of the Philo character comes across as more... I dunno... dynamic... forceful, strong, dramatically 'over the top' ... than I might have expected the character to be. I think this is a function of the medium. Shy, recessive types don't project well from a stage. Alexandra Wilson, who plays Pem (and also some of the background ensemble characters), with her period wig, soft, classically feminine features and forceful delivery does Pem much justice in both appearance and portrayal. Unfortunately the "Pem" character is not nearly as well developed as the "Phil" and "David" characters, nor is the depth of their bond and personal commitment to each other. But, except for that part where the character onstage is seen smoking a cigarette, I think Pem would be pleased with the way she has been portrayed in this production. I think it is fair to say that the second act still has some kinks to work out. It moves very quickly through complex issues. 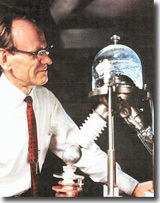 It is confusing, trying to differentiate what Zworykin was shown in the lab (how to seal flat pyrex into the end of a tube) with Zworykin's own contributions to the art (or, at least, those that RCA appropriated on Zworykin's behalf, but that issue goes beyond the scope of this assessment). 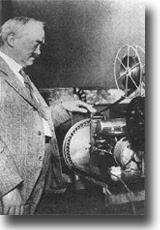 The crux of the climax rests on the issue of photo-cathode sensitivity, which was an issue for all the tubes of the 1930s until a variety of elements were combined into the Image Orthicon tube (which is at least 75% Farnsworth inventions and patents). These issues get sort of sloshed around in a confounding soup that hurtles the story into the "patent litigation" scenes, which move quickly and with some humor -- perhaps too quickly for the audience to follow until the concluding dialog. Which dialog will surely be the focus of the most strident "History -v- Hollywood" debates. Anybody familiar with the story knows that the decision in the 1934 interference ends with the words "Priority of invention is awarded to Philo T. Farnsworth..." But in The Farnsworth Invention, the litigation ends with a judge saying "....Vladimir Zworykin." What Sorkin has done here is borrow elements from the '34 interference -- like Justin Tolman showing up with the sketch Philo drew for him "in September, 1920" -- with the behind-the-scenes case where RCA finally managed to get a patent issued against Zworykin's 1923 application. The scene is followed by Sarnoff stepping forward and saying something like, "I'm not really sure if we won or lost that one... maybe we lost in court and won in appeal..." At the very least, there is some ambiguity expressed. But certainly not enough to suggest the underlying truth, which is that Farnsworth in fact won all his litigation with RCA. The point Sorkin is trying to make is that, despite the actual outcome of all the litigation, Farnsworth somehow "lost television," which, if not 100% correct legally, is certainly true historically. 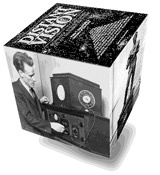 There is no mention made of the fact that a year after that 1923/38 patent was granted, Farnsworth became the first "outside inventor" to ever get past RCA's prime directive to 'collect... not pay' patent royalties. And as we all know, RCA went on for 60 years saying that "Vladimir Zworykin invented the Iconoscope for RCA in 1923...." Perhaps a future draft could have the Sarnoff character would come forward as the "unreliable narrator" and say "we just made that up..."
In fact,I suppose it's possible to imagine an entirely different approach to the material: I suppose the "Philo" character could have been written as a towering genius and flawless paragon of virtue, and the "Sarnoff" character as a relentless, vengeful bully with no conscience. Instead, both characters are portrayed as complex, multi-dimensional human beings -- at least as the playwright has imagined them to be. Whether or not we agree with them, such choices are the playwright's prerogatives. It may well be that the second act could be strengthened by drawing more closely on the facts of the case. But, then, that's what you would expect me to say, since the "facts" is all I've lived with for thirty years. As a playwright, as a creator of popular culture, Aaron's job is to make the choices he thinks will breath life into the drama embodied in the facts. If I knew how to do that, I'd have written this myself thirty years ago. There are other "unfinished thoughts" that might serve the story well were they further developed. For example, in the penultimate scene, where "Sarnoff" and "Farnsworth engage each other directly, Farnsworth says of the riches he has supposedly just lost, "...That billion dollars might have come handy ... "
But those of us who know the story can hear in our own mind's ear the rest of that thought: "...that billion dollars might have come in handy... there's no telling what I might have invented if I'd had that at my disposal..." -- because we know what he would have invented if he'd had the means to pursue his own vision into the future. That particular scene ends with Sarnoff addressing the audience, saying, "I never met Philo Farnsworth... I just made that last part up..." But there is one unmistakable element of truth to the scene, which is central to the whole story. Sarnoff has implored Farnsworth to "come work with RCA. But Farnsworth turns down the offer, on the simple grounds that he does not want to have somebody else "telling me what to invent." I think the play gets that part dead right. And the final scene comes so close to the payoff that I've always imagined: The entire ensemble gathers around an invisible television to watch the Apollo 11 launch (as opposed to the lunar landing four days later)... Pem is standing right behind Phil as he watches but... the apocryphal line some of us know so well is not uttered. Ah well, there's still time for another re-write before it goes to Broadway. I knew Pem Farnsworth very well. She was nice (and patient) enough to let me try to video tape a documentary about her when I was a student at San Francisco State University. We had one stipulation, that I not try to "put words in her mouth." I told her: Pem, I am trying to get words out of your mouth." We had a good laugh about that, and that was not the last laugh we shared. I must say this: Pem would not have liked someone sticking a cigarette in her mouth. She would have flipped! Cliff Gardner, who was also my friend, would not have given a whit! I will not repeat some of the jokes Cilff used to laugh about. (Little kids might be watching). That's about all I care to add right now, except to wish everyone who has worked so hard all of my best. That is why they are working in Hollywood, and I'm sitting in San Francisco scratching my head and wondering: "Why did I major in Electronic Communication Arts?" I do have a song I wrote called 'The Invisible Frontier.' copyright Ron Farnsworth 1995. Pem and Cliff both got a kick out of it. Mr. Sorkin, may I send you a demo tape? I am Richard C. Webb who somehow was posted for a copy of the above subject blog. Thank you for calling my attention to this latest attempt to push Philo Farnsworth to the top of the list of television inventors, eclipsing all others. Particularly those last three words. This has been going on for a long time and I thought it would quiet down with Pem's passing. Evidently not, so I am impelled to speak up and attempt to head off what might otherwise contribute to an enormous historical distortion. Why am I qualified to do this? At 91 years of age, I am one of the last living RCA engineers who worked under Sarnoff and Zworykin along with Ray Kell and a handful of others who actually spun the ideas together that made it possible to build the powerful color television system that the world has been watching for half a century. 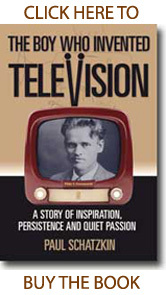 In this short note I can't tell you the story but please add to your reading list my recent book titled, TELE-VISIONARIES: The People Behind the Invention of Television. It was published by IEEE/Wiley Books in 2006 and gives an eye witness account of what actually went on within the RCA laboratory building in Princeton , NJ during the 1940’s and 50’s and explains where the engineer/inventor Philo Farnsworth stood among the inventors of television. I notice that just entering the first part of the book’s title into your search engine brings up a review and various sources of it. I am compeled to respond to Mr. Webb's comments. To say that you hoped that all of this would quiet down with Pem's passing is an insult to the intelegence of everyone who is familar with her work. Pem Farnsworth never said that Phil Farnsworth created the vast infrastructure that television became. She simply said he invented it. And I would like to add that he did it with $25,000 and within a years time. RCA and it's parent company, General Electric might do well to use it's resources as tightly as Farnsworth did. That's what it is all about, conserving energy. Not blowing a lot of hot air. One point that Mr Webb seems to be overlooking is the fact that this is a "dramatic" representation of events. Not a documentary. Writers will always take one or two sides of an argument and have their characters work from this point of view, because it's a work of fiction. Can we honestly say that Henry V stood on the field at Agincourt and gave such forceful oratory? Did Saliere really have everything he said in Amadeus to say to Mozart? Plays are supposed to stir us, make us think about a situation or a series of events, it has never been designed to be a blow by blow account of events - unless those events can hold themselves up to dramatic prose - the ephemera that would be involved in the in between momenteous moments of the birth of TV would make the show unwatchable. Instead the writer takes the elements that will have the most impact and burns them down in a crucible until they have a compelling story. Shows based on historic events will always have inconsistancies and someone will find inaccuracies, but that doesn't mean it won't make for a good show, this doesn't mean that people won't come out of the theatre and want to know more, that's what historical drama is supposed to be about. Where have you been all my life? I would just like to take the time to invite everyone to San Francisco for the 80th aniversery of the invention of television this Sept. 7th. We are having a few scheduling problems, because it co-insides with the 40th aniversery of the Summer of Love and nobody remembers when that happened either. Questions? Comments? We would love to turn you on.